Home » Our Blog » Does Your Child Need Dental Sealants? 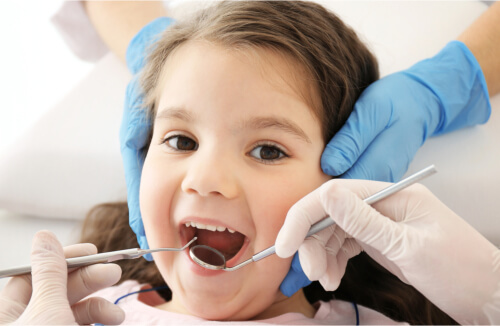 As a parent, cavity prevention probably tops your list of oral health concerns for your children. After all, kids are not exactly known for their exceptional hygiene nor their disdain for sweet treats and candy. Sure, they brush their teeth morning and night and come to the dentist for regular cleanings and check-ups twice a year, but could you be doing more to protect them against the long-term effects of tooth decay? Could dental sealants hold the key to cavity prevention? Continue reading to find out. If you have children, you’ve probably heard of dental sealants, whether from a fellow parent or from your dentist. You may have even benefited from sealants yourself since they have been used by dentists since the 1960s. With decades of success and research behind them, sealants have been proven both safe and effective in the prevention of tooth decay. Sealants are exactly what they sound like – hard seals designed to protect the tooth against harmful bacteria that can lead to tooth decay. They are typically applied to the pits and fissures of the molars, which are especially prone to decay. The application process is fast and completely painless, and the benefits can last for many years – often as long as a decade or more! To apply a sealant, the dentist first prepares and cleans the tooth. Then, the tooth is thoroughly dried, and a liquid is painted onto the tooth where it will harden in place. Though it is still possible for a protected tooth to develop decay, the presence of sealants dramatically reduces that possibility. Keep in mind that dental sealants are generally resilient, but they do require some care. Your child should continue to brush and floss sealed teeth and the surrounding gums, as well as continue to visit the dentist for regular check-ups. The dentist can check the sealants for signs of chipping or damage and repair any areas that have been compromised by adding more sealant material to the teeth. Compared to the cost and discomfort of repairing a decayed tooth with a filling or root canal, a sealant is usually a welcome investment for parents. In fact, these treatments are often covered in full or in part by dental insurance plans, although you should contact your insurer for details about your individual coverage. While sealants may not be right for every child, the National Institute of Dental and Craniofacial Research recommends that sealants be applied as soon as molars erupt the gums – particular the “6-year molars” that appear between the ages of 5 and 7, as well as the “12-year molars that appear between the ages of 11 and 14. When indicated, sealants may be recommended for other teeth (besides molars) that have deep pits and grooves, as well as in older teens and adults who are prone to tooth decay. However, only your Houston dentist can determine if sealants are the preventative solution for you. Contact the team here at Briter Dental for more information about dental sealants and whether they could be right for you.